In 1967, television history was made when two masked crime fighters met in a historic crossover. Now, superstar filmmaker Kevin Smith and actor/comedian Ralph Garman join forces with artist Ty Templeton (BATMAN 66) to bring these two iconic characters and their famous partners together again. 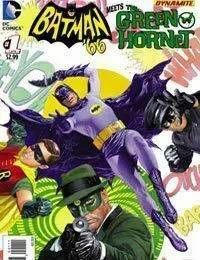 Set in the continuity of that earlier team-up, Batman, The Green Hornet, Robin and Kato must go up against a very different General (formerly Colonel) Gumm. What crime could be so deadly as to force these rivals to put aside their differences and join forces again? And what surprise does Gumm have up his sticky sleeve? Co-published with Dynamite Entertainment.